Vendor & Artist Demonstrations: tricks of the trade All demos located in: Concert Hall (Vendor Room), Stage Artist Demos sponsored by Jewelers Mutual Insurance Company Jewellery Photography Presented by Paul Ambtman of Digital By Design. Learn the basics of good photography techniques, lighting equipment, Wednesday, May 15, photo editing, and the possibilities with digital tools like Photoshop. 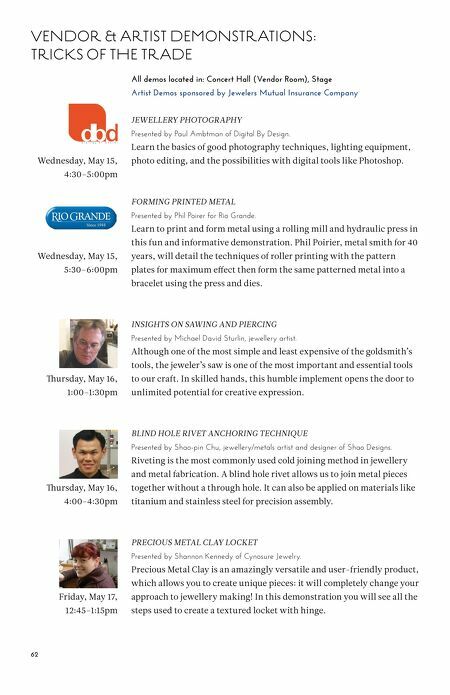 4:30–5:00pm Forming Printed Metal Presented by Phil Poirer for Rio Grande. Learn to print and form metal using a rolling mill and hydraulic press in this fun and informative demonstration. Phil Poirier, metal smith for 40 Wednesday, May 15, 5:30–6:00pm years, will detail the techniques of roller printing with the pattern plates for maximum effect then form the same patterned metal into a bracelet using the press and dies. 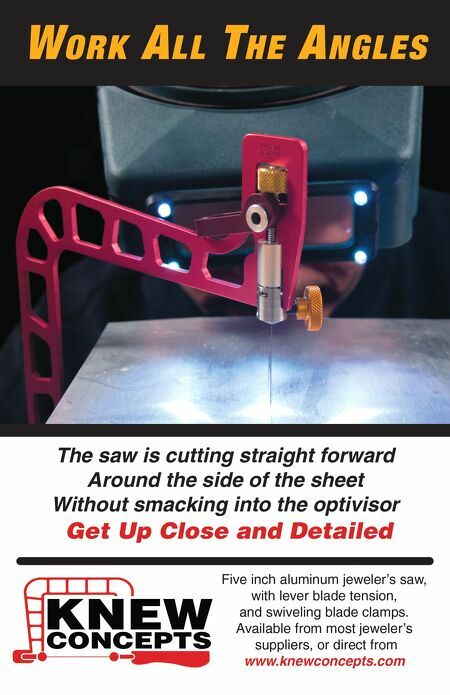 Insights on Sawing and Piercing Presented by Michael David Sturlin, jewellery artist. Although one of the most simple and least expensive of the goldsmith's tools, the jeweler's saw is one of the most important and essential tools Thursday, May 16, 1:00–1:30pm to our craft. In skilled hands, this humble implement opens the door to unlimited potential for creative expression. Blind Hole Rivet Anchoring Technique Presented by Shao-pin Chu, jewellery/metals artist and designer of Shao Designs. Riveting is the most commonly used cold joining method in jewellery and metal fabrication. A blind hole rivet allows us to join metal pieces Thursday, May 16, 4:00-4:30pm together without a through hole. It can also be applied on materials like titanium and stainless steel for precision assembly. Precious Metal Clay Locket Presented by Shannon Kennedy of Cynosure Jewelry. Precious Metal Clay is an amazingly versatile and user-friendly product, which allows you to create unique pieces: it will completely change your Friday, May 17, 12:45–1:15pm 62 approach to jewellery making! In this demonstration you will see all the steps used to create a textured locket with hinge.